University Systems offers a "build-your-own website" service that allows personal homepages for subscribed faculty and staff on web.uvic.ca. This web space can be used to host web pages, where owners can add and maintain content, as well as set permissions. All faculty and staff are allotted 1 GB of disk space, to be used either for email or web space. All computing usage at UVic, including personal web spaces, are subject to policy IM7200. Review the web.uvic.ca Terms of Service for further details. Faculty and Staff will need to request webspace by completing the Web Spaces Request Form. The URL for your site will include your personal NetLink ID: https://web.uvic.ca/~NetLinkID. a secure Internet connection to the UVic network either on campus, or via VPN. 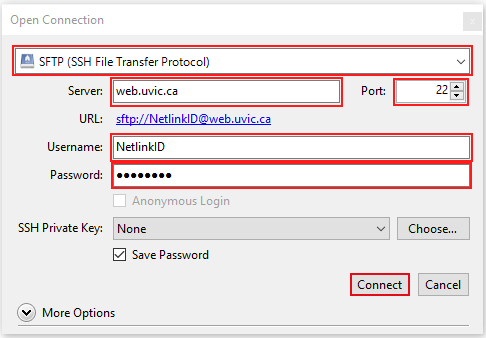 To add files to your web space, you will need to connect to the web.uvic.ca server using an SFTP client. Once connected, documents that you want to display on your site should go in the www folder. You may choose to restrict access to your website, since UVic websites are by default available to the public. More information about creating web pages can be found on the UVic Communications website. 1. 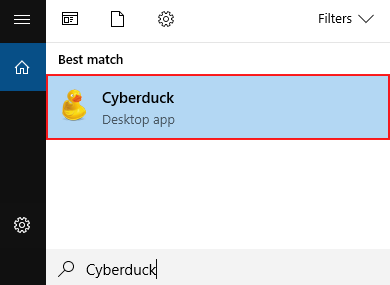 Ensure that you have downloaded a Secure File Transfer Client, such as Cyberduck. 2. Launch the File Transfer Client by finding the program in the Start menu (Windows) or in the Finder (Mac). 3. The main application window will open, click the Open Connection. Connection Type: From the drop down menu, select SFTP (SSH File Transfer Protocol). Server: the server to which you'd like to connect. For Faculty and Staff, the server will be web.uvic.ca. Username: your login ID for the server. For web.uvic.ca, your username would be your personal NetLink ID. Password: your password for the server. For web.uvic.ca, your password would be your NetLink ID password. Port: 22 (22 is the SFTP port). NOTE: Access to web.uvic.ca is restricted to on campus and VPN networks only. 4. 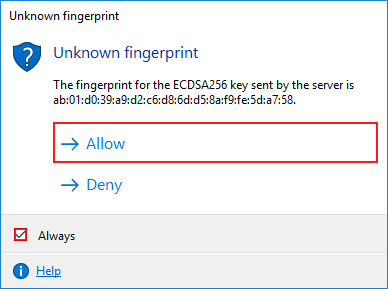 You will see a host key message, showing the fingerprint for the server to which you are trying to connect. For security reasons, ensure the displayed fingerprint matches the actual fingerprint of the server. Fingerprints for many host at UVic can be found here. If the pattern in the alert matches the pattern for your host, check the box that says Always to always trust this host, then click Allow. Alternatively, you can deselect the checkbox and click Allow to trust this key only for the current session. 5. The files and folders on the server should appear. From here, you will be able to view and transfer files. Files and folders related to your web space should go in the www (live site) or www-dev (production site) folder.